Harlow is a striking short cut that is razored smooth to the ends. Wear this short style with blunt or fringed bangs. Harlow is an easy style that any one can wear. 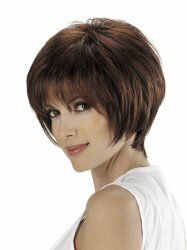 Ultimate Fit Wigs were designed to fit comfortably, snugly and the light weight materials make for a real Cool Fit. The Best of the Soft Touch Collection by Tony of Beverly. Soft Touch Collection wigs are made with light and airy caps with a finer fiber for a Soft Touch experience. Product Collection: Soft Touch Collection by Tony of Beverly. Ultimate Fit wig by Tony of Beverly.